Wound Management Technologies, Inc. is an emerging commercial stage company with its primary products in the $5B worldwide advanced wound care market. Wound Management's primary focus is the distribution of its unique, patented collagen product, CellerateRX®, which is FDA cleared and reimbursable under Medicare Part B. Wound Management has other advanced biotech products in development including a patented resorbable bone wax line that is in late stages of development, as well as a subsidiary focused on technology for secure healthcare communications, data collaboration and storage. Rapid revenue growth is projected from our leading FDA cleared CellerateRX wound care products, which recent market and clinical validations show to be clinically cost effective with broad uses. 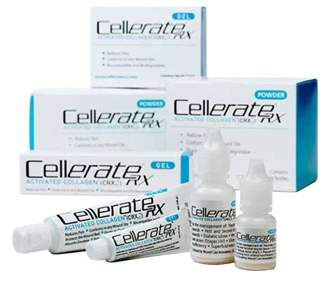 CellerateRX has a competitive proprietary feature and performance advantages over other collagen-based products. It is available in powder (95% collagen) and gel (65%) forms that don't need special handling (like refrigeration). It is active in all 4 phases of wound healing. As CellerateRX revenues grow, the company is positioned to become cash flow positive and profitable in 12-18 months. CellerateRx Activated Collagen targets a multi-billion dollar domestic and international wound care market with over 60% profit margins. A large part of the growth in the wound care markets is from diabetic ulcers. In people with compromised health or circulation, the difference in wound healing can be significant. You can read through numerous evidence-based studies on the www.celleraterx.com website. Wound Management Technologies, Inc., (OTCQB: WNDM | WNDM.PK) a leading innovator in advanced wound care solutions, today announced that its subsidiary, Resorbable Orthopedic Products, LLC, has entered into a Development and License Agreement with Newport Beach, CA-based BioStructures, LLC to develop products for bone remodeling in the human skeletal system based on ROP's patent. BioStructures has paid ROP an initial $100K licensing fee and the agreement calls for ROP to receive additional license fees as well as royalties on sales throughout the life of the patent. Under this contract, minimum royalties will begin in 2013 and last until 2023. Initial commercial sales from this business are expected in 2013. "This transaction allows us to combine our portfolio of proprietary biomaterials with a patented resorbable wax carrier. The combination of these products will further enhance the dynamic product lineup of BioStructures," said Russell Cook, CEO of BioStructures, LLC. "We are pleased to have reached a license agreement with BioStructures to develop many of the orthopedic products related to Resorbable Orthopedic Products' patent on resorbable bone wax and bone void fillers. This agreement is the first commercial agreement for our subsidiary ROP and marks the start of a second product line for WNDM," said Deborah Hutchinson, president of Wound Management Technologies. "We believe that BioStructures is the right partner to develop and market these important orthopedic products and we look forward to strong success of these products in the marketplace." ROP's patent was developed by WNDM advisor Barry Constantine and his associates and was acquired by WNDM in 2009. Mr. Constantine will oversee ROP's development responsibilities with BioStructures. "Commercialization of the BioStructures product containing the ROP technology in addition to the development and commercialization of other embodiments within the ROP patent advances the practice of orthopedic surgery," said Barry Constantine. "We are excited to see our technology move into product development with BioStructures." Resorbable Orthopedic Products may commercialize additional products covered by the patent, including a resorbable orthopedic hemostat (resorbable bone wax), a resorbable orthopedic hemostat antimicrobial dressing and products for the veterinary market.